Have you ever thought of monitoring blog stats and tracking traffic data to your Blogger blog? If so, then it’s time to analyze your Blogger blog stats and traffic sources using Google analytics. Here in this post we will see how to add Google analytics to Blogger blog. Just a day back we made a post on how to add Blogger blog to Google webmaster tools. Where you will come to know that how Google has a view on your site. You can fine tune your Blogger blog by knowing and fixing all the errors in webmaster tools. While in Google analytics you will know the complete traffic statistics, sources and measures to your blog. Google Analytics is a free service from Google which shows accurate stats and real time traffic to your blog. Yes! Real time traffic, you will know where traffic comes from; the number of people currently viewing your blog and the amount of time each visitor spends on your blog. Moreover you will know the number of unique visitor to blog, new visitor, returning visitor, bounce rate and much more. In order to access this feature you have to make Google analytics to track your Blogger blog. 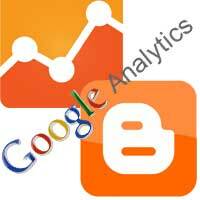 In just a few steps you can easily install Google analytics in Blogger blog. Go to Google Analytics and login with your Blogger or Gmail account. Now click on sign up to start using Google Analytics. You will now see two features such as Google analytics for website and mobile app. Just select Website. Now fill in all the necessary details below such as account name, website name, URL, category and time zone. Click on Get Tracking Id at the bottom of the screen when you’re done. Now accept to Google Analytics terms and condition. Google Analytics now provides you with Tracking ID (UA-43435378-1) and tracking code. Just keep the page open and move on to your Blogger blog. In your Blogger blog you have to setup two things one is the tracking Id and other one is tracking code. You have to add this tracking code in your blog template and so backup your Blogger template before proceeding to this step. In your Blogger dashboard go to template >> edit HTML. Now press CTRL + F and find out </head> tag. You will now see <b: include data=’blog’ name=’google-analytics’/> just above the </head> tag. In Google Analytics click on Admin at the top right corner and select property >> tracking info. Now you will see the tracking status. In Google Analytics go to property settings page and at the bottom associate your webmaster tools site. By associating you will see webmaster data in your Google analytics reports. Google Analytics updates your site report each and every day. So just wait for 24 hours to see your blog data in Google Analytics. Hope this post helped you on how to add Google Analytics to Blogger blog. Share and subscribe to our RSS feeds.